Today's the day we'll finally get to know the new and highly awaited OnePlus 2. An event anyone will be able to experience as if they were there, thanks to its virtual reality broadcast. 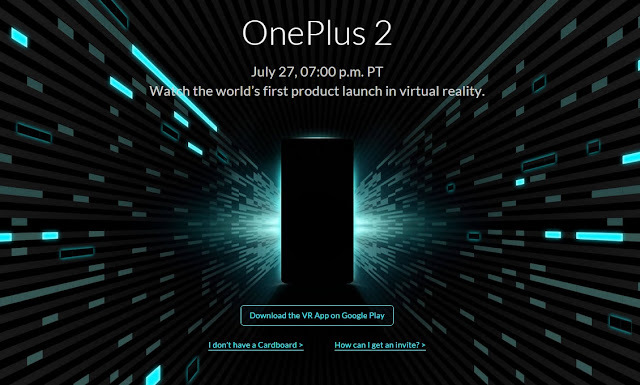 OnePlus has already launched the OnePlus VR app you can use to experience it using cardboard VR Googles, tough you can still use it without goggles and still pan the image around. The company has already unveiled many of the details about this new "flagship killer" over the past weeks, and indeed it seems to have everything anyone could ask for (though there's some concern over the Snapdragon 810 "hotness"). High-res screen, check; 4GB RAM, check; fingerprint reader, check; and so on, and so on. The main point everyone's waiting for is: how much will it cost? That's unless OnePlus is keeping any special and unexpected surprise to entice it's fans - though I'd very much expect that surprise to be the price itself. OnePlus has stated the price will be higher than the popular OnePlus One, and it would be a very big surprise to find out otherwise. We'll have a few more hours to wait and find out. But one thing's for certain: the new OnePlus 2 will be using the same invite system that will leave users hunting for an invite in order to be able to buy one... unless the price isn't so enticing after all.